I grew up in Kalamazoo, Michigan, and over my 20+ years living there, I drove past Harrison Park thousands of times. Located on the northeast edge of town, the small triangular-shaped park is in what was the city’s Polish neighborhood. Growing up, I remember my Dad pointing out several buildings in the neighborhood that tied back to the family. A few years ago, my Dad mentioned that there was a monument at Harrison Park, dedicated to the fallen men of World War II, Korea, and Vietnam that were from that neighborhood. With two ancestors that were killed during World War II, my curiosity was piqued. My next visit to Kalamazoo included a stop at Harrison Park, and sure enough, there was the monument. Among the men listed were Francis Piotrowski (1918-1944) and George Topoll (1918-1943), my ancestors. 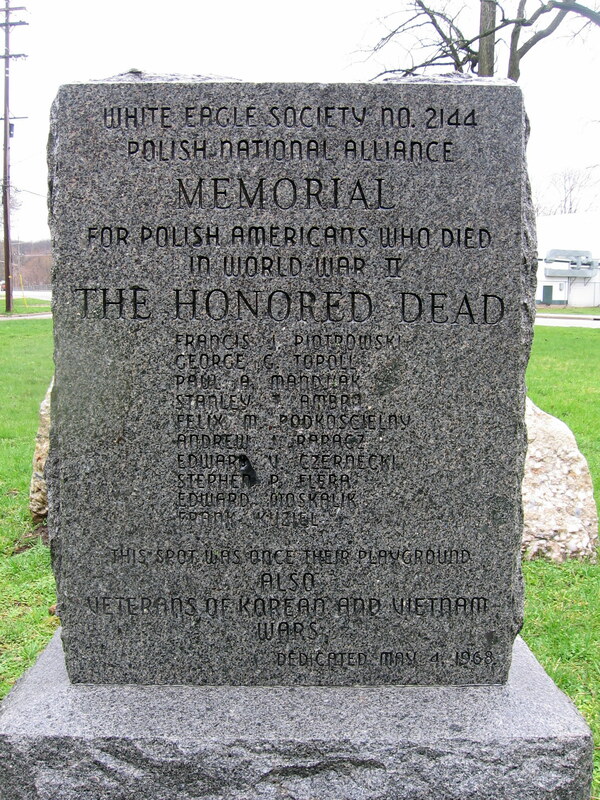 Discovering the monument was certainly important, but the big find was the lodge number and name of the Polish National Alliance (#2144, White Eagle Society), the fraternal group that dedicated the monument as a memorial to those Polish men who had died during the war. Francis’ father – Stanley, my great-grandfather – was very active with the PNA, and I now had identified the lodge he’d been active with. I’d driven past Harrison Park thousands of times over the years, but had never noticed the monument, its historical significance, nor its important genealogical value. I had been so focused on the names and dates on my family tree, learning as much and as quickly as possible, I had failed to take a step back and explore the historical context of my ancestors’ lives – the neighborhood they called home, the parks they played in, and the national events that shaped their lives. I had nearly missed a vital piece of my family’s story in the old neighborhood. A lesson learned!